Successfully Added Champion - Lightweight Sports Edition Watchphone with Keypad to your Shopping Cart. Finally a sports style watchphone! The Champion is a convenient and lightweight sports model watchphone with Tri-band GSM connectivity and an extensive array of useful features. Say goodbye to large and heavy watchphones and say hello to the Champion! The Champion is the budget priced solution to the more expensive and larger watchphones you find on the marketplace today. But don’t let the wholesale price fool you. 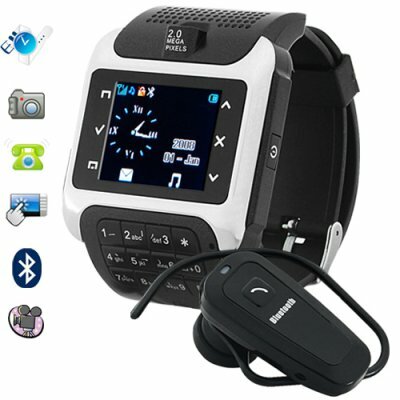 This watchphone is jam packed with excellent features such as touchscreen navigation, hands free Bluetooth connectivity, MP4 media player and a micro SD (Bonus 1GB Micro SD included) slot to store all your favorite songs, pictures, and videos! This lightweight and durable watchphone comes with a built in mic and speaker, and works with any GSM 900/1800/1900MHZ network. The Champion also has an on-board camera, FM radio, sound recorder and world clock. With all the great features this stylish watchphone offers, it is hard to imagine a better all- in-one device at such an incredible price. If you live an active lifestyle and don’t want to be weighed down by over-sized accessories then this watchphone is the perfect device for you. Whether you are playing basketball or running a marathon, with the Champion you will completely forget that you are wearing a watchphone and can continue your day without restraint. The M62, a.k.a The Champion, even comes with a Bluetooth earpiece so you can get crystal clear communication without the hassle of headphone wires getting in your way. Order one today and say goodbye to the additional baggage of a cellphone or big watchphone. This masterpiece is in stock and ready for next day shipping. The Champion is proudly presented to you by the leaders in wholesale electronics, Chinavasion! NOTE: This product is compatible with GSM at the three frequencies of 900MHz, 1800MHz, 1900MHz. NO. This model mobile phone wrist watch is not waterproof because of its keypad. The watchphone should be kept dry at all times.